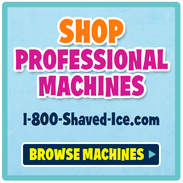 Whether you're an awesome parent looking for a shaved ice machine for your kids or an organization looking for a commercial shaved ice machine, we've got you covered. Hawaiian Shaved Ice specializes in high-quality shaved ice machines to bring the spirit of the islands to your taste buds. These popular machines produce icy treats and are perfect for a summertime (or anytime) cool-down! Start off small with a kid-friendly shaved ice machine (hand crank). These are perfect for a DIY cup of shaved ice with the kids or even for a little roadside shaved ice stand. 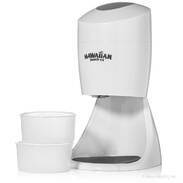 The Hawaiian Shaved Ice machine is a great shaved ice maker for home-use because of the size, ease-of-use and price. Good for serving a few fluffy servings a day, just like the shave ice from your local favorite! These household machines are known for delivering cool and refreshing Hawaiian snow at a moment�s notice. 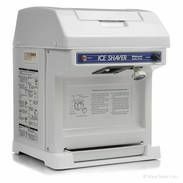 Both the manual and the electric shaved ice machines are inexpensive, portable, and easy to store in a kitchen cabinet or pantry. The Little Snowie 2 ice shaver is the perfect mid-range machine for 20-30 servings per day. Its iconic band blade is the secret behind this small shaved ice machine. Get a professional quality without emptying your pockets! Are you a true entertainer? Consider a heavy-duty commercial shaved ice machine for your next party - the Hatsuyuki HC-8E shaved ice machine. 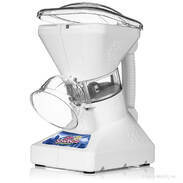 This professional machine is ideal for producing many servings at once or throughout the day. Family reunions, weddings, school carnival, church events or your next big birthday bash wouldn't be complete without this ice shaver. Combine any machine with the best shaved ice syrup - this side of Honolulu. Top your favorite flavored ice with a spoon straw and add other fun accessories to your order today!